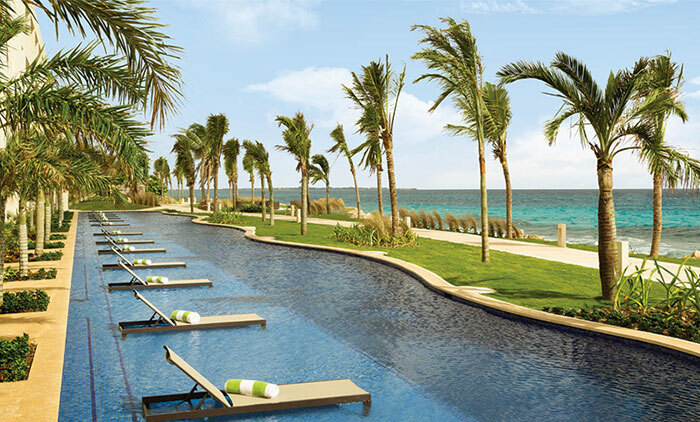 If you are in search of a relaxing vacation where the food and drinks are unlimited, detailed planning is not required, your days are filled with spectacular beach views, and five-star service is available for your every need, then the Hyatt Ziva Cancun may be your next getaway. Located just 25 minutes from the Cancun airport, you can leave home in the morning and be on the beach with your Miami Vice cocktail by late afternoon. With picky kids or varied types of eaters in your family, the wide variety and unlimited options mean you are bound to eat abundantly. The breakfast buffets boast huge selections of fresh fruit, continental options, and local Mexican flavor. Most of the luxury resorts in the area are adults-only, so perhaps what is lacking at the Hyatt Ziva in gourmet quality is made up for in quantity and options. Throughout the day, and into the night, enjoy Asian (Hibachi makes a great show for the kids), Mexican, Italian and French options, or our favorite – the American diner. The pools offer poolside snacks, as does the Club Lounge. If you want to test out your own artisan beer, have a go at the in-house brewery. All that said, the most wholesome fun stop was at the Starbucks-style coffee shop where adults can get their energy lift on frappes, almond milk lattes, or coffee free smoothies, and the next door candy shop where kids can get their lollipop fix. Poolside drinks include basic liqueurs, soft drinks and frozen cocktails perfect for when the kids are the KidZ Club. Set off in a supervised area with its own tree house and slide pool, the Kidz Club offers kids ages 4-12 a full day of water play (in a separate pool), arts and crafts, video and arcade games, and daily treats. Well-designed and staffed, it is worth giving your kids and yourself a break for a few hours in the mid-day heat. In any direction, you will find a pool with a million dollar view. We stayed close to the club pool which was quite windy but the breeze was nice for the hot days. We took our little one for some quick swims, but it was definitely not the best pool choice for small kids. For that, try any of the other pools which seemed like a great choice for kids playing pool games while their parents enjoyed Miami Vices on repeat. The main pool has loud music playing throughout the day, which is either a benefit or a minus, depending on your preference. BEACH – one of the main pluses of Hyatt Ziva is the white sand and calm beach water that you can easily walk out in and kids can play in without major waves or currents. Seaweed is present but cleaned all the time, and from what we hear about other area resorts the amount is really minimal in comparison. Finding the time to fit some fitness in between baby changings and organizing the kids’ pool bags is not easy. The spacious and well-equipped gym is smack in the middle of the resort, so quick access is not an excuse. Even better, double down while getting some sun and join an aqua cycle (twice a day) or one of the pool fitness classes going on at the main pool throughout the day. The concierge at the club building was unprepared for providing baby-basics. During checked-in, the crib we requested in advance was nowhere to be found (though this was quickly remedied), and rather than receiving a tea kettle in the room (key for hot water for bottle cleaning and warming), we had to call room service each time we wanted hot water and they would send up tea pots. Definitely not ideal. Also, the showers did not have tubs. We were given a baby tub, so it wasn’t a problem, but may be something to consider.